Capaldi holds the record for the greatest number of international caps awarded to an Argyle player whilst with the club. He was born in Porsgrunn, Norway because his father was playing for Pors Grenland at the time (he was John Capaldi, also a professional footballer, who had previously played for Aston Villa and Motherwell). However, Capaldi junior qualified to play for Northern Ireland because of a grandmother who was born in Limavady, County Londonderry. He began his career as a 17-year-old trainee at Birmingham City in 1998, and signed professional forms with them two years later. He never made the senior side at St Andrew's but did make 14 first team appearances for Hereford United - then a Football Conference side - whilst on loan there for most of the 2001-02 season. With Capaldi's opportunities limited to Birmingham's reserve side throughout the following campaign, Argyle manager Paul Sturrock brought him to Home Park for a short trial, and in April 2003 his free transfer was agreed. By this time he had already won four under-18 caps for Northern Ireland (including his only international goal) and 14 at under-21 level, so it came as no surprise when he made the step-up to the senior side in March 2004. He won all but one of his 22 full caps whilst at Home Park, beating Moses Russell's record 20 internationals for Wales during his Plymouth Argyle career (out of his full tally of 23). Russell held the club record for over 78 years until Capaldi won his 21st Northern Ireland cap, ironically against Wales on 6th February 2007. One of Capaldi's caps had been in the Province's famous 1-0 win over Sven-Goran Eriksson's England side at Windsor Park in September 2005, which temporarily de-railed England's qualification campaign for the FIFA 2006 World Cup in Germany. Capaldi was a regular on the left side of midfield or at left-back during his four years at Home Park, and will be especially remembered for his trademark long throw. 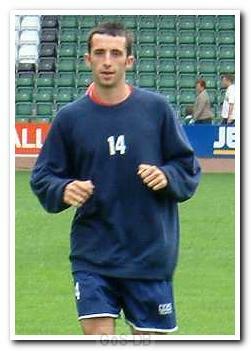 He left Argyle in May 2007 after controversially rejecting a new contract, moving to Cardiff City on a free transfer. He became a regular in the side that reached the FA Cup Final in 2008, picking up a runners-up medal after playing all 90 minutes of the 1-0 defeat to Portsmouth. A knee injury saw him lose his place at Cardiff, and in November 2009 he joined Leeds United on a short term loan before being released by the Welsh club at the end of that season, having made 77 appearances for them. Capaldi returned for a trial with financially-stricken Argyle in July 2010 but could not agree terms, and then had trials with Crystal Palace and Heart of Midlothian before joining up with former Northern Ireland manager Sammy McIlroy at Morecambe, where he made 18 appearances in the 2010-11 season. He then spent two, injury-impacted seasons at Oxford United, making 39 appearances before signing for Conference National side Tamworth and then Northern Premier League Premier Division sides Barwell, and Rushall Olympic. Not the most popular of players with some, a mixture of some not liking his laconic style and some not liking the way he 'played out' his time with us, under the Bosman ruling. Some people also remember that awful last minute miss at Vicarage Road with the game locked at 0-0 when we really could have done with the extra two points. However, he was a cultured player and his record shows how many games he played for us in the CCC, and he certainly was a constant feature in the team when he was with us. The silly memory I have of his tenure was in Block 14, there was an Argyle fan there who, over the Christmas period, had imbibed more than his fair share of alcohol. He was singing 'Tony Capaldi, Tony Capaldi' for about 5 minutes non-stop, not one person joined in. Then, in a fit of pique, he turned on us surrounding fans and shouted 'Come on your miserable b****rs, it's only three words'. People were crying with laughter for a good 5 minutes after that one.